My husband started his pharmacy internship a few weeks ago and I thought that needed to be celebrated! 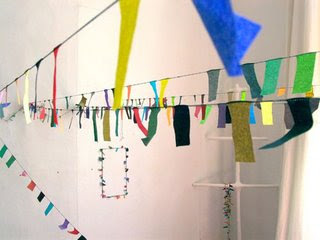 So on his first day, inspired by the beautiful work of sophie cuvelier and armed with stacks of multicolored paper and fishing line, I was soon stringing our dining room with garlands. J came home to find me finishing up dinner and after saying hey, he looked past the kitchen and saw the garlands hanging in the background. He immediately started laughing and then picked me up and thanked me with a kiss. I told him how proud of him I was (in addition to everything else he does, the kid has a 4.0 in pharmacy school! ), how much he means to me, and how much I appreciate all he does so I can follow my dreams as well. Some people might think it's cheesy, but I think that sometimes we all need to celebrate the ones we love- whether that be a significant other, family or friends- and thank God they're in our lives. P.S. The garlands are still hanging in the dining room.